He asked and you said YES! So… what happens now? This is when the fun begins! Not all couples have the typical one year engagements, so instead of using months as our timeline we will break this down into three major parts with smaller, achievable steps. I know what you’re thinking: “This isn’t the fun stuff!”… but I promise, we will get to that. 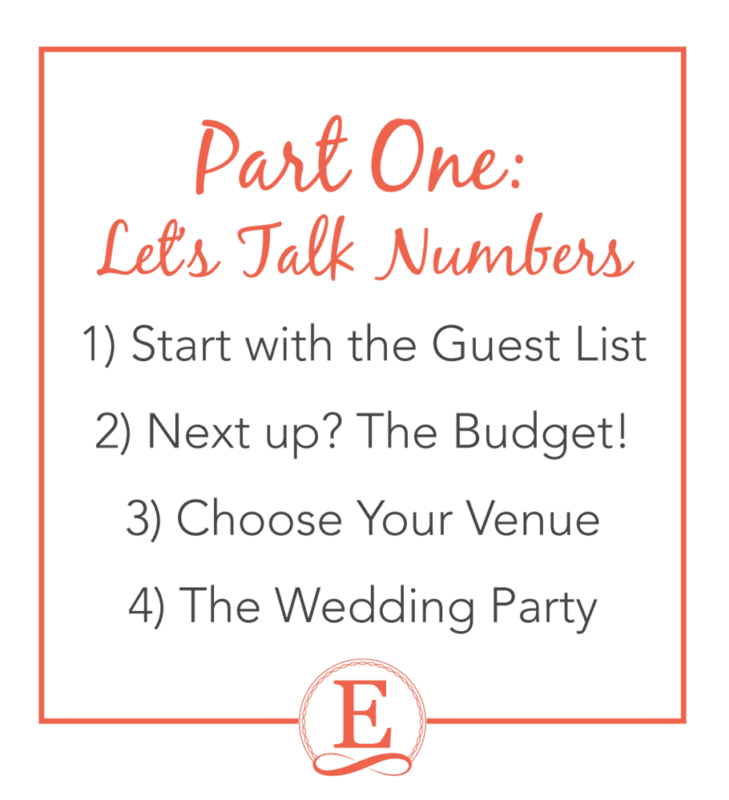 This number is going to determine your venue size and drives the budget. Typically 70-80% of your invites will attend. Not only establish a number, but also where the funds are coming from. Wedding wire has a fantastic (and free) budget guide that you can download here! Now is a great time to discuss your bridesmaids and groomsmen with your fiancé. Will you have one? How many on each side? What are their roles? We’ve been seeing more and more mixed wedding parties – it’s not all guys on one side and girls on the other anymore! You have the facts and figures, let’s focus on the vendors. Who and what do you need to put together your wedding day? If a Wedding Planner is not included with your venue, this should be your next priority! 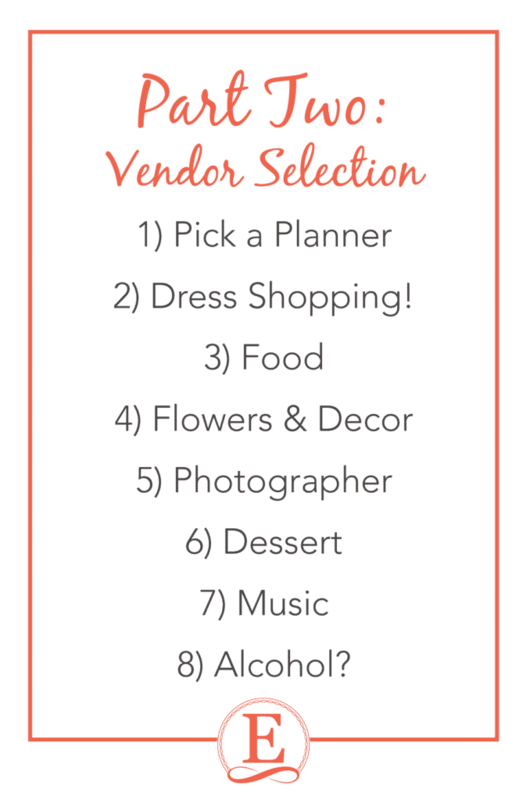 They will do the footwork, help with vendor suggestions, manage day-of, and be there when you’re having a hard time choosing the white vs ivory napkins. Yes, they are lifesavers. Remember I said we would get to the fun part? This is fun! Take your favorite people and spend the day trying on all the gorgeous dresses. Is catering included with the venue? If not, it’s time to pick a caterer. Entwined Events venues include the cost of catering in wedding packages, but will still provide you with numerous options to consider to make your wedding day unique. Will you choose buffet style or table service? Will you choose relaxed southern cuisine, or an upscale five course dinner? Check out the styles of the floral designers and make sure to ask if they carry any non-floral decorations. Bella Rose Floral & Designs is a great example of a team that not only provides high end floral arrangements, but also plenty of non-floral options to incorporate into your décor, such as table linens, assorted lanterns, terrariums, and much more. Who do you want photographing these special moments for you? Do you also want a videographer? Be sure to pick someone you feel comfortable with – you want to be relaxed and smiling in your photos! Don’t hold back if you are looking for the non-ordinary. These can double as favors. Guests love these fun details! You can go with the traditional tiered cake, or, like many of our brides, have a little fun by serving cupcakes, mini-cheesecakes, cake pops, or by providing a donut wall, s’mores bar, hot chocolate bar, etc… This is a great chance to let your imagination run wild! Live band, DJ, or a combination of both? A great DJ helps to get the party started by introducing the wedding party, playing games, and getting people on the dance floor, so you want to ensure they have an upbeat, infectious personality. Are you having a bar? You’ll need to check with the caterer and venue on their ABC license or if you need to get your own ABC license. Want another fun addition? Consider having signature cocktails to represent the bride and groom! More shopping! Go scan all the fun things in Target, Bed Bath & Beyond, or even consider an online registry through Amazon.com or your other favorite online retailers! Your guests are coming to your big day to show you how much they love you, and taking time to consider their wants/needs is the sign of a great host. Consider transportation to and from the wedding (especially if you have an open bar), as well as hotel blocks or renting guest houses (like the incredible Lodge at Charlemont) for guests. 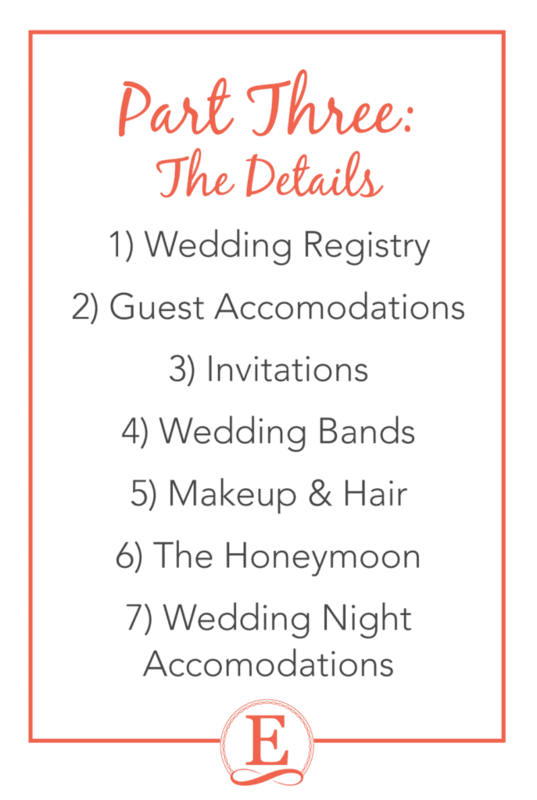 Now that you have the registry and accommodations for guests figured out, you can send out your invitations! Be sure to give people all the gift/travel info they will need on top of the who, what, when and where. Gone are the days of standard wedding bands – there are nearly as many options for your wedding bands as your engagement ring! Even grooms have a plethora of metals and designs to choose from. Will he choose platinum, titanium, cobalt, or tungsten ceramic? There are a huge variety of beautiful options out there at your fingertips (pun intended)! Don’t try anything radically different than your daily routine. Dramatically changing your hair color or style right before the wedding might cause you to cringe at your wedding photos later on. Be yourself, but amp it up to the next level. Will it be you, a friend, or a professional? Where is some place you’ve always wanted to explore? Be true to yourself – if you’re not into the beach, don’t bother going to a Caribbean resort! Visiting a new city stateside can be just as fun, with a lot more to do! And, if you’re headed out of the country, don’t forget your passport! Are you staying near your venue? Do they offer any on-site lodging options? Are you flying out that night for the honeymoon? Keep the timeline in mind. Most importantly – don’t get overwhelmed! Take it one step at a time. You will be amazed at how incredibly generous and helpful people will be when they know you are planning your wedding. Better yet? You can choose a wedding planning company like Entwined Events with packages that include a wedding planner, florals, decoration, transportation, catering, serving alcohol, lodging, and many of the other details so you don’t have to worry about wrestling with, coordinating, and paying a long list of vendors. Sound interesting? Contact our sales office at 434-515-3106 for more information. Nice piece of article and helpful to those who are getting married. I liked your way of explaining in such detail and stepwise as this will make the idea more clear of what to do as most of the times the couples panic during their wedding about various things.Keep sharing such posts.